One of the fascinating aspects of tiger beetle study is their often high degree of fidelity for specific habitats. Some species prefer wet habitats, while others frequent the drier uplands. Some like sand while others need clay. Differences in salinity, vegetational cover, and even slope dictate what species might be expected to occur in a given habitat, thus, the diversity of tiger beetle species one encounters is directly proportional to the diversity of habitats explored. Unfortunately, tiger beetles can be rather ephemeral in their occurrence as adults. Despite a life cycle that requires at least one year (and may take 2-3 years or even more), adults are often present for only for a few short weeks. Even during the time that adults are present, they often hide if conditions aren’t right (too cold, too hot, too wet, too early, too late, etc., etc. Add to that their marvelous evasive capabilities, and it’s a wonder I ever see or catch any at all!). The study of tiger beetles is not, however, entirely dependent upon the adults. The presence of larval burrows in an area is also useful information, and through understanding of the species that might occur in an area and their habitat preferences, it is possible to identify – at least tentatively – the species that might be living in them. To the uninitiated, tiger beetle burrows might seem nothing more than a simple hole in the ground – anything could have made it. 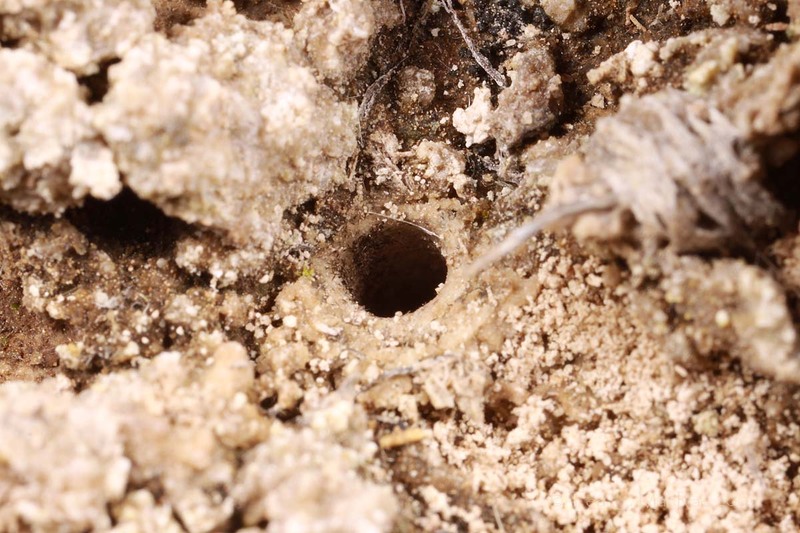 However, with experience one becomes able to distinguish tiger beetle larval burrows almost instantly from burrows made by other ground-burrowing organisms. The most common type of burrow is recognized by a combination of characters – almost perfectly circular except for a slight flattening on one side that gives the burrow a faint D-shape, and with the edge smoothly beveled. This is your classic tiger beetle burrow and, for most U.S. species of Cicindela and related genera, averages ~5-6mm in diameter for 3rd instar larvae (tiger beetle burrows are most often observed at 3rd instar, since it is this final instar in which the larva spends the majority of its time and the burrow becomes most noticable). The above burrow is one such burrow, found at Monroe Canyon in northwestern Nebraska last September. While a number of species are known from the area, there are only a few that make their burrows in deep dry sands such as those that occur at this site. We can eliminate Cicindela formosa (big sand tiger beetle) for reasons discussed below, and we can also dismiss Cicindela limbata (sand blow tiger beetle) because the habitat is not the barren, wind-shaped sand blow habitat that the species prefers. This leaves two possibilities – Cicindela scutellaris (festive tiger beetle), a common and widespread inhabitant of sand habitats throughout the Great Plains, and Cicindela lengi (sandy tiger beetle), a much more localized resident of sand habitats with more western distribution. The burrow likely represents the latter, since adults of this species have been found with greater frequency than C. scutellaris on the very fine-grained sands that occur in this part of Nebraska. My confidence in this ID is bolstered by the fact that a larva I collected in the area from just such a burrow successfully finished its development and emerged a few months later as an adult C. lengi. Sometimes size alone is enough to indicate the species responsible for a burrow. The above burrow was encountered last September in southwestern South Dakota on a clay/shale embankment in sage/shortgrass prairie. A number of tiger beetle species fond of clay were observed at the site, including the two generalist species Cicindela tranquebarica (oblique-lined tiger beetle) and Cicindela purpurea audubonii (Audubon’s tiger beetle). 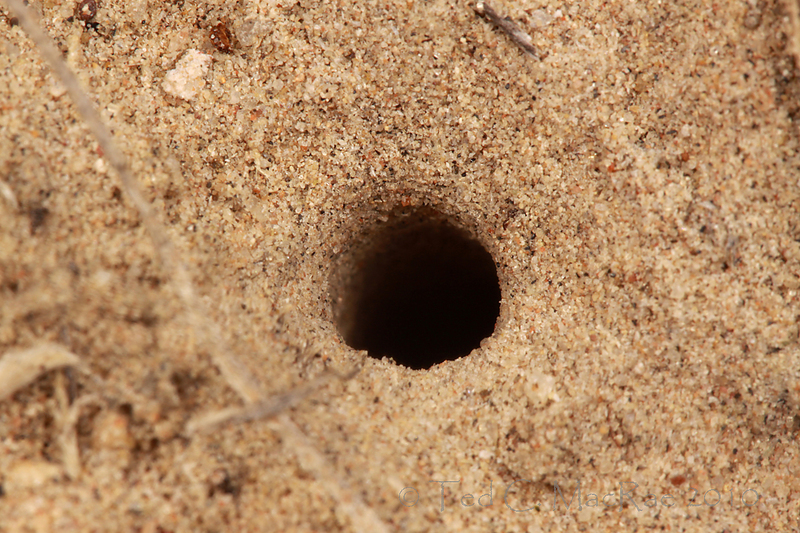 However, at ~8 mm in diameter the burrow is too large to have been made by either of these species. The only tiger beetle in the area capable of making a burrow this size is Cicindela pulchra (beautiful tiger beetle), and in fact this burrow was found at one of several sites recently discovered by Matt Brust for this species in South Dakota. Note again the classic shape – slightly flattened along the bottom side (the flattening accommodates the mandibles of the larval head – tiger beetle larvae always orient themselves in one position when sitting at the burrow entrance). Just as large size was diagnostic for the previous burrow, the small size of the above burrow was also diagnostic. This burrow, found at Alabaster Caverns in northwestern Oklahoma in October, 2009, measured only 3-4mm in diameter and can only have been made by Cylindera celeripes (swift tiger beetle). This provisional ID was suggested by the fact that adults of the species had been observed abundantly in the lichen-encrusted clay exposures of this shortgrass prairie the previous June. This photo, in fact, represents the first-ever discovery of the larval burrow of this species, and the identity of the species was confirmed when the larva collected from this and neighboring burrows and placed in rearing containers in the lab later emerged as adults. I have found very similar-sized burrows in bottomland forest habitats in southeastern Missouri where the closely related species Cylindera cursitans has been seen. The burrows are identical in size and shape, but the drastic difference in habitat is enough to distinguish the species that made them. Not all tiger beetles utilize the simple hole-in-the-ground style of burrow, but rather incorporate some rather unique engineering features that make specific identification much easier. 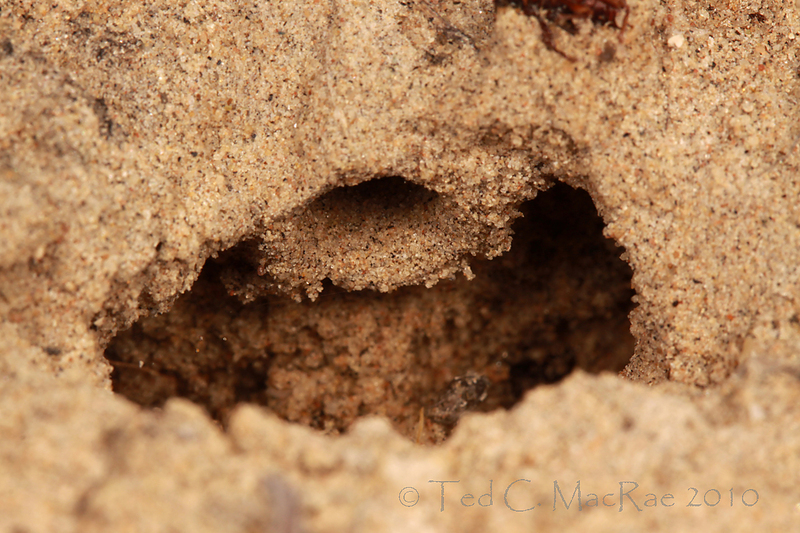 This burrow can only be made by Cicindela formosa (big sand tiger beetle), a common resident of a variety of dry sand habitats throughout the Great Plains and eastern U.S. 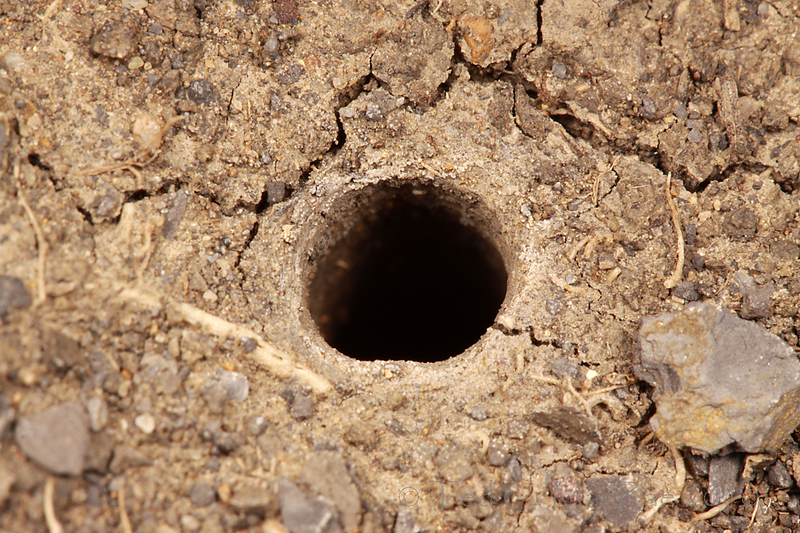 The burrow entrance is on the large size for U.S. Cicindela (~6mm in diameter), and rather than opening flush on the ground it is directed horizontally and opens into a pit that is excavated to one side and underneath the burrow entrance. No other U.S. tiger beetle makes a burrow quite like this (although I have noted Cicindela limbalis (common claybank tiger beetle) burrows on steep clay banks with a similar but much less distinct excavation on their lower side). The pit apparently functions as a trap for potential prey, and since I have most often encountered burrows of this species in areas with some slope, I suspect the pit may help the larva capture its prey by preventing the prey from tumbling down the slope at the first sign of trouble. This is a different burrow by the same species, also at Monroe Canyon last September, that shows a 3rd instar larva sitting at the burrow entrance. The sickle-shaped mandibles are resting against the slightly flattened lower edge of the burrow entrance, while the round pronotum fills the rest of the entrance profile. 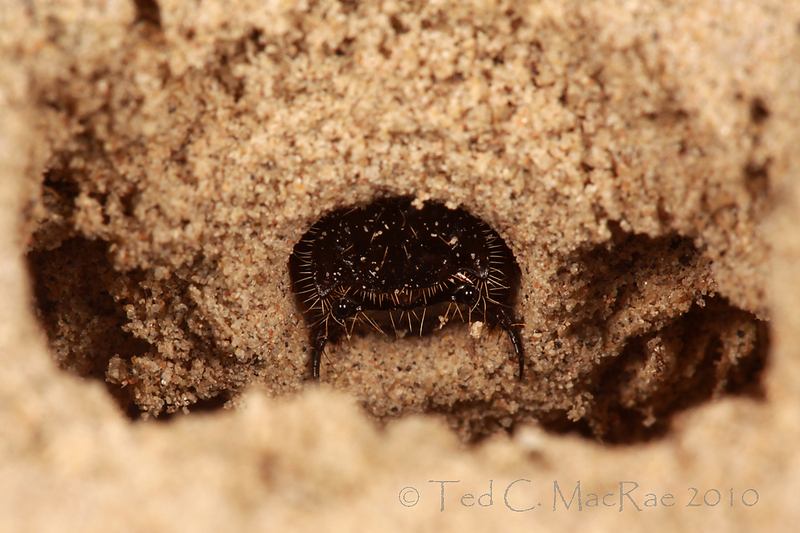 The upper pair of eyes can be seen above the mandibles, but the lower pair (between the upper pair and the mandibles) are not visible in this photo due to the downward-facing angle of the burrow entrance. I waited for quite some time with camera in position in hopes that I could photograph the larva, and when it did return to the burrow entrance I had time enough to fire off just a couple of shots before it retreated once again to safety in the depths of its burrow. This unusual-looking burrow was found in a dry clay saline creek bed in the Badlands of northwestern Nebraska last September. The turret structure is unique, but the nearly perfectly round and smoothly beveled burrow entrance identify it, nevertheless, as that of a tiger beetle larva. These burrows can only be made by Cicindela fulgida (crimson salt flat tiger beetle). There are several other saline-tolerant tiger beetles species in Nebraska, but most such as Ellipsoptera nevadica knausii (Knaus’ tiger beetle), Eunota togata (cloaked tiger beetle), and Habroscelimorpha circumpicta johnsonii (Johnson’s tiger beetle) require much more moisture than was found in this bone-dry creek bad. I’ve found two other much more widely distributed clay-associated species – Cicindela tranquebarica and Cicindela purpurea audubonii – at this and other sites where I’ve seen C. fulgida; however, the larvae of those species do not utilize this unique turret-shaped structure for their burrows. The turret is thought to have a cooling function for the larva during the heat of summer by raising it above the hottest layer of air against the white salt-encrusted ground and by aiding in the dissipation of heat from the larval burrow. I wanted to photograph the larva sitting at the burrow entrance and spent quite a bit of time stalking out this and nearby burrows for a chance to do so. Alas, however, on this day the larvae had greater patience than I! The above burrow entrances were photographed in September 2008 at the same dry saline creek bed in Sioux Co., Nebraska. I mentioned above that Cicindela tranquebarica kirbyi and Cicindela purpurea audubonii both occurred commonly at this site along with Cicindela fulgida; however, these burrows likely represent the former. That species seems to be found more consistently in high saline environments than the latter, which in this case probably have their larval burrows in the more normal clay soil further away from the creek bed. 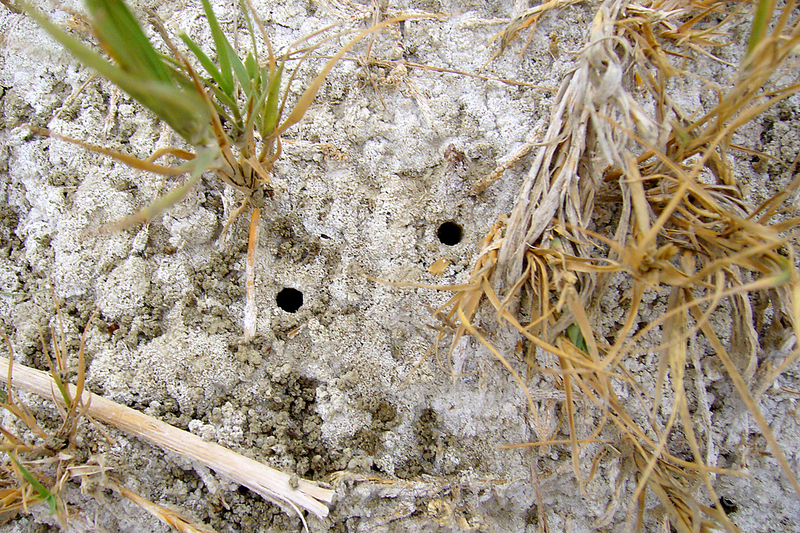 During that 2008 trip, I did collect larvae from burrows like these in several similar, high saline habitats in Nebraska, South Dakota, and Oklahoma, and in each case adults of C. tranquebarica kirbyi were what emerged. I have also reared this species from larvae collected on clay banks and wet sand habitats – in all cases, the burrows are a tad larger than those I have seen for other species in the genus that I have reared, such as Cicindela limbalis and Cicindela repanda (common shore tiger beetle) – logical since adults of C. tranquebarica tend to be a little more robust than these other species (but smaller than Cicindela pulchra and Cicindela obsoleta vulturina (prairie tiger beetle)). In the above photo, I believe the the upper-right burrow is that of a larva, while the the lower-left one is that of an emerged adult – note the not-perfectly-circular opening and more ragged edge to the burrow. In fact, the latter burrow looks very much like the adult emergence burrow that I saw at this very location last September, in which the still unemerged adult was seen sitting! Granular chunks of soil can be seen scattered about the latter burrow, but I believe these were actually tossed by the larva rather than the adult as a result of burrow excavation – the amount of soil an adult would need to remove to re-open its burrow for emergence would probably be far less than what can be seen in this photo. I did not search the surrounding grasslands for larval burrows, but if I had done so, it is likely that I would have found similar burrows that belonged to the larvae of Cicindela purpurea audubonii – the only other tiger beetle that we have seen in this inhospitable place! This entry was posted in Cicindelidae, Coleoptera and tagged beetles, entomology, immatures, insects, nature, Nebraska, science, South Dakota, techniques, tiger beetles. Bookmark the permalink. Very interesting. The burrow of C. fulgida reminds me (slightly) the burrows of Lycosa sp. in semiarid areas of Spain. I have always thought that the turret with small twigs around the entrance were for protection, but could also serve to thermoregulation? The occurrence in semiarid areas seems to support a possible thermoregulatory function. We have borrowing wolf spiders here also that make such turreted structures (though much larger than the tiger beetle) – I have not yet had the fortune to observe one of these sitting at the burrow entrance. Fascinating! A reminder to be a bit more observant of the “minor” details. Thanks, WW – it’s the details that make it all fun! Interesting article, and ties in with a book I’ve been dipping into, ‘Tracks and Sign of Insects and Other Invertebrates'(by Charley Eiseman and Noah Charney, Stackpole Books, 2010). Tiger beetle larva are mentioned in the section on ‘Unadorned Holes’, but it does not give an account by species. In the ‘Burrows with a mound to one side of the entrance’ section it again generally includes ‘some’ tiger beetles, with a photograph of the burrow of a Coral Pink Sand Dunes tiger beetle, (Cicindela limbata albissima) that flicks out 3mm sand-pellets to form a mound a few cm’s from the hole. I’m curious on how the holes are left ‘unadorned’. Do they flick out the sand or do they do some sort of sweeping motion by extending out of the burrow? If I’d had unlimited time and space, I would have put together a table of the substrate/habitat preferences of various tiger beetle species–that kind of specificity fascinates me. I’d never heard of the turreted burrow entrance of Cicindela fulgida before; very neat to see. Maybe someday I’ll get to do a 2nd edition and add some more of this type of information. For now I can at least add a link to this blog from the book’s website. Last year I saw tiger beetle larval burrows in the clay tennis courts at Amherst College. Would love to know what species was responsible for those. I am reminded that I still need to get this book – thanks for linking me up. Ted, I’m also intrigued by the turrets – it seems they would defeat the reasoning that I’d heard for why they keep the hole area flush to the ground – so that prey are more likely to stumble over the hole. I posted an image to our website here representing some holes that are about 4mm wide with a distinct lip on them from vertical clay banks in Tennessee. Any chance you recognize them? When you said you’ve seen Cicindela limbalis (common claybank tiger beetle) with excavations below, do they always do that, or just sometimes? That’s a really neat strategy. Hi Noah. Tiger beetle larvae don’t really need prey to stumble over the burrow entrance – they just need to wander by close enough for the larva to lurch out and grab it. I’ve watched them feed many times in my rearing – they’ll grab prey from forceps when still a cm away. It would certainly make things easier if the turret wasn’t in the way, but in extreme environments I suspect there is a trade-off between ease of foraging and thermoregulatory needs. The photo you posted has the look of Cicindela limbalis burrows that I’ve seen here in Missouri. I’ve only seen the excavation on a small percentage of these burrows – most look like the one in your photograph and are on vertical to near vertical clay banks. I’m amazed that they ever encounter any prey at all in such a situation, much less enough to complete their development! If the turret is always in a clump of vegetation like that, it may not be a disadvantage at all–the larva would be well positioned to grab anything climbing up or down the plant. Although the turrets of Cicindela fulgida are most frequently (though not exclusively) found embedded within vegetation, those of another turret-building species (Cicindela willistoni) are found almost exclusively on barren saline flats in the southwest. Knisley and Pearson (2008) ascribed a thermoregulatory function to the turrets of that species as well, and rather than being a disadvantage for feeding, they speculated that the turrets actually facilitated prey capture by attracting small insects to their shade. The larva tosses the soil pellets with its head – larger larvae can actually flick them quite a distance. 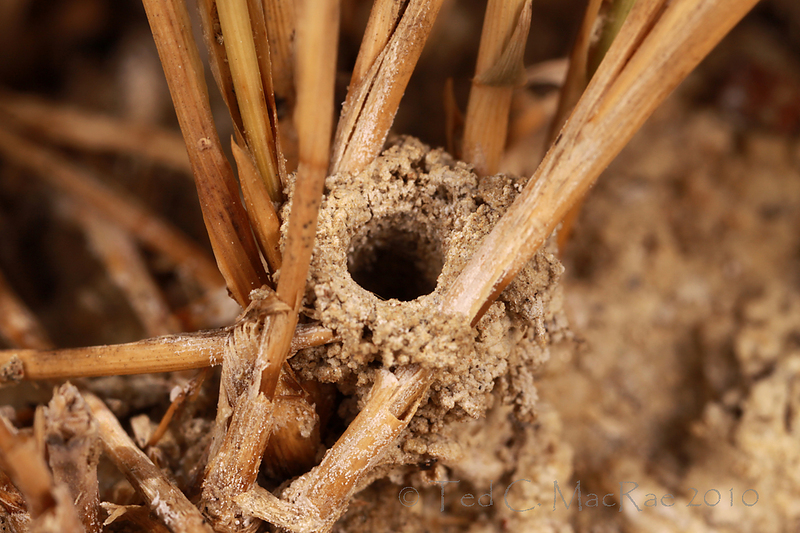 In the photo of the Cylindera celeripes burrow above, you can see a debris field to one side of the burrow – larvae always maintain the same orientation, so soil pellets tend to always get tossed in one direction. It’s fun watching them do this! Great article as well as terrific photos. Thanks, Troy – glad to see you lurking the net again! For years I had seen and recognized the larval burrows of Omus in the Sierra Nevada. With the prevailing wisdom being that there was only one variable subspecies of Omus californicus for the entire range, I had spent little time looking for the adults. Still I made mental notes of where the burrows were located and habitat selected. In the past few years I have decided to delve into the morass that is Omus taxonomy and these prior observations have proven invaluable in my efforts. The first step in locating adult Omus is finding the burrows, from that point on success is a matter of being there at the right time. Its always worthwhile to note the presence of Tiger Beetle larvae, such fascinating creatures! Fascinating, Ted. Well done. You continually keep your blog interesting. word of the day: “morass” … I had to look it up …. Thank you Delbert! To be honest, I’m a little surprised at the great interest in this post – I thought it would be a little throw-away post, of interest only to a few die-hard folks. A related word that is one of my favorites – quagmire! Have you collected or reared any of the Omus larvae? I’d love to have one pickled if you can manage it sometime. Tiger beetle larvae are almost as charismatic as the adults. You’re right – fascinating little creatures! I have Omus in my backyard (here in the Sierra Nevadas). When I was out looking for Pleocoma burrows this rainy season, I saw many burrows which had to be made by Omus. If you or Dennis have any insight as to when the larvae might be active, I will attempt to collect some for you. I have tried the “fishing” technique to no avail, but then, I’m not sure I had active burrows. I’m planning to run some pitfall traps for adults this year as I have had some success with that in the past. Dennis probably has better insight than I, but the adults are nocturnal so I would expect the larvae are also. I’ve taken to digging up larvae when they don’t respond to “fishing” – I insert the grass stem all the way into the burrow and then excavate the ground around it. Once I’ve excavated to the depth of the burrow (as indicated by how far the grass stem had to be inserted), I undercut the burrow and start chipping the soil off the bottom of the chunk until I find the larva. The deeper the burrow, the more patience that is required! Very interesting post. I learned something new. Very interesting post. Next time at Willcox Playa I’ll pay even more attention to those holes in the ground. I would have a field day at Willcox Playa with the tiger beetle superdiversity there. I suspect there is some interesting habitat partitioning going on in placement of the larval burrows regarding moisture level and vegetational cover. It will thus come as little surprise to you, though it does to many others, that I can often identify the species of ants in a nest beforeseeing them, just by the architecture and placement of the excavated material around, and the size of, the entrance . In that case, I need to get better pictures thereof. You’re welcome, Francis – thanks for reading. Very nice, Ted. I appreciate your detailed photos and excellent field observations in your posts. Bravo as well for the detailed species associations with habitat types. I was not aware that Cicindela fulgida larvae built a turreted-top borrow similar to C. willistoni. Good information, and as they say, you can learn something new every day. A thorough study, perhaps based on mtDNA analysis, of the C. willistoni populations from various dry lakes in south and central California and Nevada, currently considered C. willistoni echo – is required. From my observations, true C. willistoni, sensu lato are turrett builders, whereas, the populations I mentioned above are merely holes in the substrate. In addition, there are differences in some of the male aedeagi and larval morphology. It is possible that some of these cryptic populations may actually represent undescribed subspecies. I had already begun sampling several of the populations but life got in the way and I have since moved on to other projects. County, California at least in one summer season. As per the mtDNA studies we’ll leave that up to others. Thanks, Charlie – I appreciate the nice comment! I live in the Northeastern area of NC on the Perquimans River. I have a burrow in my back yard that is about 10 feet from a wooded lot and yet in a bare patch of dirt where there is no grass. Our dirt is quite high in sand content. The burrow is about 3/4 in in diameter and appears to be about and exact circle. In addition it has to be about 1foot deep. I would have never noticed it, except for the huge pile of dirt/sand next to it. I saw the insect in it for a split second and saw just the back end and remember it to be a type of beetle body and reddish brown in color. Today, my husband thinks that he saw the thing flying. We could see it from quite a distance, so it appears that the bug is at least 2 in long. Any thoughts on this thing? The tiger beetles for this area don’t seem like what I saw, so ready to make a trip? Need some pictures? Hi Sara — the size is too large for a tiger beetle (or most other beetles, for that matter). My guess would be a spider or perhaps even a cicada killer wasp. If you can get a photo with actual measurements that would help greatly.